Occasionally I like to take a look back at an older novel that is remrkable in one way or another. 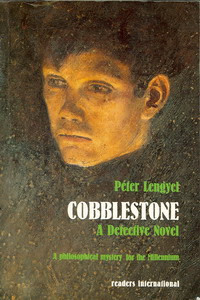 One of the most remarkable is Cobblestone: A Detective Novel, by Peter Lengyel, a Hungarian writer better known for science fiction than detective fiction. But Cobblestone is and is not a detective novel. It's a massive story of the beginning fo the 20th century, ranging across Europe but centered on a pursuit through Budapest's streets and brothels: a master detective pursuing a master safecracker. And at the same time it's a meta-novel taking Hungarian history from the end of the 20th century back to the beginnings of the universe. Not only are there layers and layers to this tale, there is also a sudden shift at the middle of the novel that is unlike anything else in any other novel, detective or otherwise--I won't give it away, but it is either a masterstroke or the most irritating device ever attempted in fiction. But back to the detective story, the tale is a fascinating mosaic of the underworld of Budapest, as well as a fantastic heist story. It unreels like at atmospheric movie, but it is decidedly a novel, not really filmable at all. If anyone's interested, I can give more details. It's not easy to find, but it's not out of print.